Published: Oct 8, 2005 to ? Ah! 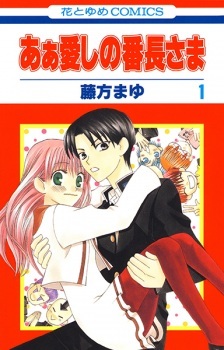 Itoshi no Banchou-sama was partially published in English as My Darling! Miss Bancho by CMX Manga on March 16 and July 13, 2010, respectively volume 1 and 2. When I first read this mange, I loved it. There was just something about it's goofy comdey romance that appealed to me. Then I reread it. And I realised that it pretty much lacked a coherent story line, and the characters were not strong enough to pull it along. The story is not unique - through the tricks and twists of fate, a formerly rich girl ends up at a normal school. Unfortunately, she is the only girl at this school. If that wasn't bad enough, she becomes the school gang leader. It is pretty sweet and funny seeing how she becomes the gang leader, and how the students treat her. This main story is repeated throughtout the series, just at different schools. The romance itself is understated, but sweet. And there is nothing amazing in the characterisation. They are all characters we have seen before. Unfortunately, they are not at all memorable. I mean, you know you know them, because they are complete stereotypes, but other than that, nothing. Let me say this first, I don't like shoujo that much. But, I love adorable things. This is my second review, something happened to my first one, don't know what, so take it easy on me. So far, (may contain spoilers? ), it's basically the heroine conquering a bunch of delinquent schools. Not much difference in each chapter except how they conquer. It sounds like it's boring right? Surprisingly, I still liked it. Though the concept was the same, it didn't really feel like it was. Like most people, I think, I usually use art as one of my reason wether I'd read the book or not. In my opinion, this book is not really detailed like the artist of Gentleman's Alliance, and there is none of the Shoujoey feel backgrounds. If I remember correctly. But, I don't think it's an amateur work either. So, it works for me. The heroine character would probably be stubborn, dense, slow (same thing as dense? ), and would make as an adorable pet. ;3 She's so cute. xD The hero would be motherly, sulky, also stubborn, and competitive for certain things. Well, those are my opinions, so don't take my word for it. 9! :la: (Know about the La? ;3) I just absolutely love adorable mangas like this, my most favorite would be Corseltel though, so~ 9! Not much here. It's only opinions I can't really describe. 8. Though I like this manga, in the end it really is another shoujo manga. This one would fall under Shoujo Manga Category #13 (random number + title) "My love is too dense to notice my feelings, so I will do my best." Though just a tad bit different? Thank You for reading. Hope it was understandable and useful.